Play has long been neglected and it’s so much more than just running around a playground for 15 minutes. Did you know that play is just as important as classroom learning for a child’s emotional, intellectual, social and physical development? In the past, children would spend hours every week playing outside – running, cycling, climbing trees, making dens and playing football with their friends. Today’s children aren’t so fortunate. We now have the most unfit and overweight children in our history, and this has had a considerable impact on their personal development as well. Today our children play 90% less than they did just a couple of generations ago. For many children, their only chance to get outside and play happens when they are at school. To make up for all that lost time playing, it’s vital for schools to make that playtime of the highest quality and variety. For Childrens wooden climbing frames, visit NI Climbing Frames. In 2015, a report from Fitmedia for the government concluded that one fifth of primary school leavers were clinically unfit and unable to support their own body weight with their arms. They were 90 seconds slower at walking a mile than their parents at the same age. They are slower and weaker, with an estimated 1.5 million children at risk of chronic illness as they grow older. Play is also strongly linked to cognitive development and emotional health. 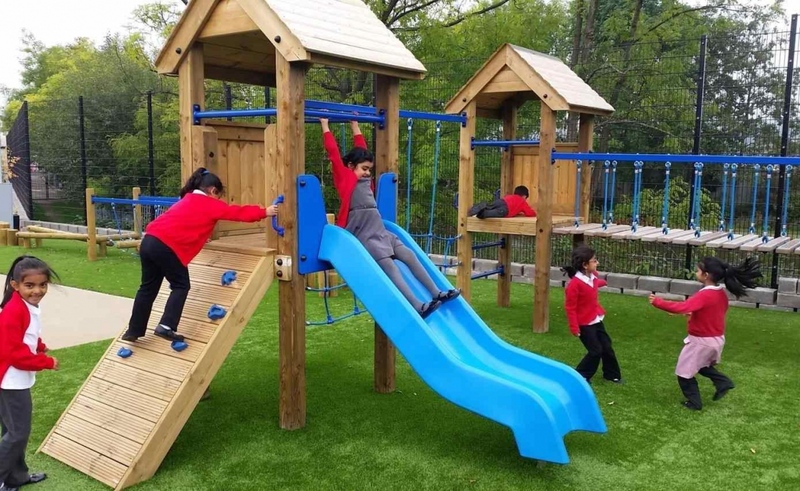 By investing in a top-quality play area, it doesn’t have to be difficult or expensive for children to get their 60 minutes a day minimum exercise recommendation. There are now hundreds of schools across the country investing in active play with staggering results. Fitness levels among pupils are high, weight issues are rare, and bullying is down 80% purely because there is so much to do. Think your school would benefit from improved playtimes now? These schools have improved attendance, high Ofsted ratings and impressive academic results. However, it sadly seems that not many new school designs have the first clue about what makes a good playground. This doesn’t mean that good playtimes are impossible. The key to achieving better development, behaviour, health and learning outcomes comes from a solid policy of informing parents and governors of the virtues and value of immersive and varied play. Every child should be able to immerse themselves in a play activity of their choice, regardless of age and gender during playtime. There must be activities on offer that challenge, engage and excite. Activities that include problems to be solved using maths and science, such as balancing objects to build structures for example or improving their dexterity and strength with Childrens wooden climbing frames. Great playgrounds don’t appear by magic and require staff training, creating interesting spaces, judging risk, storing equipment and keeping it maintained. Each school needs someone with the skills to achieve all of these things. However, the benefits are massive. The schools that value their playtimes and ensure they are the best they can be will be rewarded with success in a multitude of other areas of school life. The learning, personal development, behaviour, welfare and health of their pupils will improve substantially. What are the best tanks in the world?